PaRA Co-operative is a service provider that supports three young adults with autism who live in a house in Chatswood in Sydney. PaRA stands for Parent assisted Residential Accommodation. 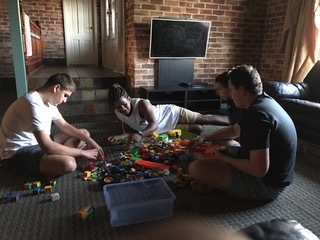 PaRA cooperative is a service provider that supports three young adults with autism who live in a house in Chatswood in Sydney. PaRA started through strong community networks within the Giant Steps school community and this provided an opportunity for families, along with school leaders, to identify new and more effective ways of enabling their adult children to live independently. Traditional group homes run by government and not-for-profit organisations involve minimal involvement of parents. In contrast, the PaRA approach has been operating successfully for almost 8 years. It involves parents being actively involved in the operation of the House which accommodates their adult children who suffer from autism. Parents, on behalf of their adult children, effectively determine policies and practices, appoint staff and perform hands on roles. They are the members of the co-operative along with staff employed at the house. The primary aim of the co-operative is to act in the best possible interests of the house mates. The members of the co-operative are the parents, staff and house mates (to the extent that they can effectively participate in policy setting, governance and operation of the service). Staff membership increases work satisfaction, vocational outcomes and productivity. PaRA co-operative has demonstrated that family governance models can work very successfully. It also has demonstrated the improved productivity and quality that occurs when families and staff work together in the interests of the young adults living in the house. The housemates have regular contact with their family and friends. This dramatically increases the likelihood of their person-centered needs being met. PaRA is the first family and staff governed co-operative operating in disability services in Australia. The cost to government of the PaRA co-operative is less because there are substantial economies of scale from “pooling” individual packages and parents have their child at the family home for some time each week significantly reducing staff costs. Parents also cover many costs such as furniture and equipment at the House, personal effects of their children, medication and pocket money etc. It also means the time that parents have with the child is much less stressful than if the child lives at home full-time. It ensures parents have the time they need to work and that they can do so confident in the well-being of their child. Family and community volunteers also help avoid costs by doing gardening and general maintenance. Extract from the PaRA Members’ Charter. Watch the PaRA Co-operative featured on ABC News. PaRA is a registered non-distributing co-operative in NSW. The six parents of the housemates plus employees. Having employee members gives them a say on policies, procedures and the operation of the home. PaRA Co-operative is registered as a service provider with the NDIS. It employs staff and manages day-to-day operations such as rent, transport, repairs, maintenance and specific care requirements for housemates. Members (which for PaRA are both parents and support workers) have autonomy, independence and democratic control. Any surplus the co-operative accrues is reinvested in the co-operative for the benefit of current and future housemates. The property is leased by PaRA Co-operative. Income comes from the housemates’ individual packages and disability support pensions. Contributions are also made by parents in the form of volunteer time as well as in the form of direct finance.